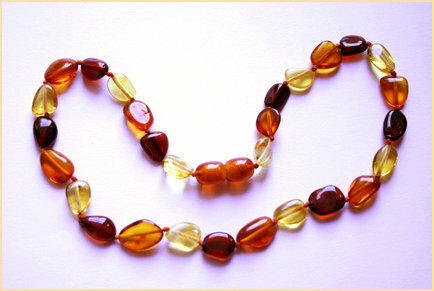 This lovely amber necklace can be worn by infants and children to naturally relieve teething pain. These necklaces feature the finest quality, large clear amber stones. They are individually knotted between each bead, making them strong enough to withstand tugs from little hands. The clasp is completely surrounded by smooth stones, so no wires or metal touches tender baby skin. This necklace is 33cm long, and I have seen babies as little as a few months old wear them. My own 2-year-old daughter refuses to take hers off, and it looks adorable on her. Mamas do report that their babies seem less fussy when they wear these! And they look great on both boys and girls. Wearing Baltic amber close to the skin is a traditional European remedy for teething infants. As a natural analgesic, amber is thought to help calm a baby just via contact with the skin. Used for centuries in Europe, amber's natural anti-inflammatory and pain relieving properties are perfectly suited to helping soothe unhappy babies. Amber is fossilized resin, which warms against the skin, releasing its therapeutic properties.